On the last morning of my 38th year I awoke 75’ up inside the arms of three trees: one towering cone-crowned Douglas Fir, its trunk deeply rutted like the lined hide of an aged elephant, plus two neighboring cedars, their fragrant and feathery fringes wagging above, below and between our skillfully strung arboreal Treeboat beds. 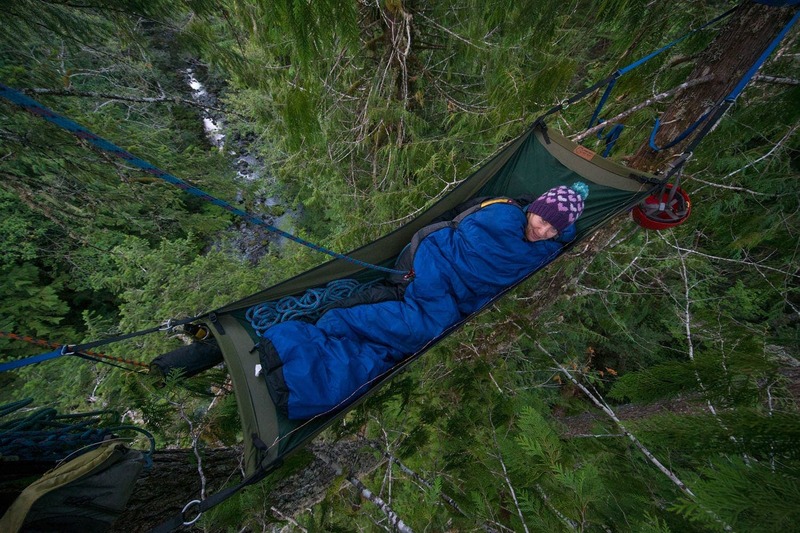 The Treeboats are technical hammocks designed to safely suspend reclining climbers. They’re capable of supporting 5,500 lbs (each!) while still being gentle to the protective outer bark of the supporting trees. It was in these Treeboats that my partner, John, and I were lulled to rest by the rush of the tumbling Opal Creek below us and where we nestled into our mummy bags to dream, in subtle sway with a barely-there September breeze. Why was I asleep in a tree? Good question. Let’s go back a twig. 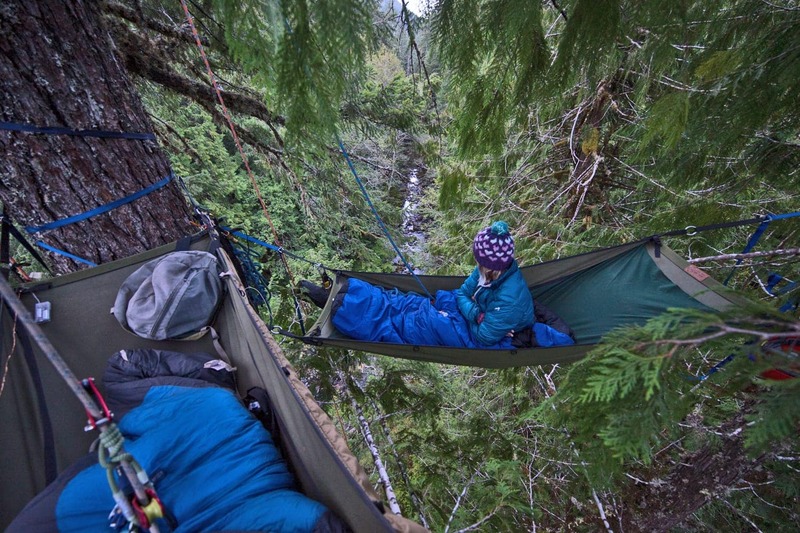 Ever since I read Richard Preston’s The Wild Trees I’ve had it in my head to somehow find myself up inside the tangled towers of a forest canopy and add “sleep in a treetop” to my very short bucket list. This past year I shared my treetop dreams with John. He had served some tree-time working with the nonprofit Ascending the Giants and had met some talented arborists. He introduced me to Damien Carré, owner-operator of Oregon Tree Care and Expedition Old Growth. 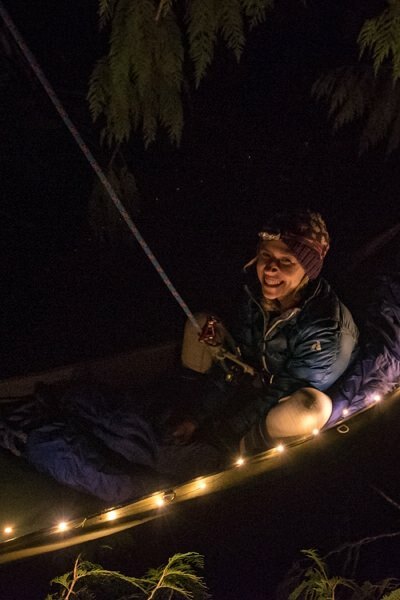 It was through Expedition Old Growth that we would be making this dream come true in one of the most recently protected Oregon treasures, the Opal Creek Wilderness. 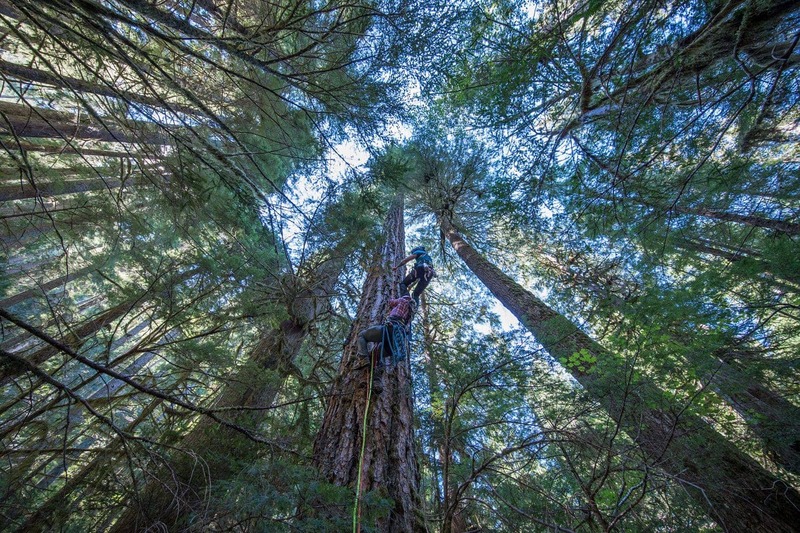 Thanks to the Opal Creek Ancient Forest Center, Expedition Old Growth was granted the opportunity to guide us to the top of an old growth tree. And so plans were made to spend my birthday climbing a big tree in an ancient grove of Douglas Fir, Western Red Cedar and Western Hemlock. I was going to spend the night among giants, some as old as 1,000 years. Opal Creek Wilderness is about an hour east of Salem. It isn’t a secret area, by any means. The heart of Opal Creek is Jawbone Flats, a rejuvenated historic mining outpost in the midst of 35,000-acres of ancient forest watershed. It’s a relatively easy 3-mile hike into Jawbone Flats. And on any given sunny day the trail is teeming with foot traffic. It’s one of those special places that one might fear is at risk of being overrun and loved to death. The goal, beyond simply sleeping in the top of a tree, was to find a way to help love this special place to life. For the weekend warriors who want to get after it and climb a tree, please don’t go it alone. Ascend alongside folks who know how to ascend with the proper care, respect, and technical skill, such as Expedition Old Growth. We met up with our guides, Damien and Ben, and tip-toed across slick river rocks to our basecamp, just feet from the clear pools of Opal Creek. Up above our heads they had already strung our Treeboats, our guest room for the night. My cheeks already hurt from smiling so hard. We wandered over to check out the Douglas Fir that we would climb that day, a tree likely climbed only one time before us, when Ben had first scrambled up to anchor our ropes earlier that afternoon. That would be where we would have a gear-training session, and then we would ascend about 200′ into the canopy. Standing at the base of this exquisite Douglas Fir I craned my neck as far back as I could and gazed up to where the sun rays flitted through the highest boughs. I couldn’t see the top. My heart swelled and spilled out the corners of my eyes. Damien and I began our climb, with Ben and John soon to follow. Our hands kept to our ropes, our toes merely tapping the trunk, to minimize our impact. About a fourth of the way into our ascent I paused, sat back in my harness and removed my gloves. My hands were sweaty. Tucking the gloves into my shirt, I proceeded climbing with my bare hands on the rope. The majority of the effort comes from the legs, not from the arms and hands, but about halfway up the tree when Damien and I took another pause to maneuver around the thickening tangle of boughs I glanced at my fingers. I had completely shredded them on the rope. Six large open blisters were exposed and glistening. The gloves went back on, and we kept climbing. Later Damien would point out an exposed area of a branch that had been scraped clean of lichen and moss — 3 or 4 inches of 100 year old lichen, gone, an effect of our visit. Even with a mindful approach, it is completely impossible to have an impact-free climb. I paused and rested my palm gently against the lichen. I wasn’t sorry for being here. But I was acknowledging that I was, in fact, an uninvited guest, and I hoped that my gratitude would be felt. It isn’t uncommon for tree-lovers like me to refer to trees as friends, to anthropomorphize them and ascribe emotions to them in ways that make us feel like we better understand them. It’s a hard thing not to do. Being human is all we know how to be. So we assume a common ground of feeling, of benevolence or appreciation, in order to think we’re communicating. 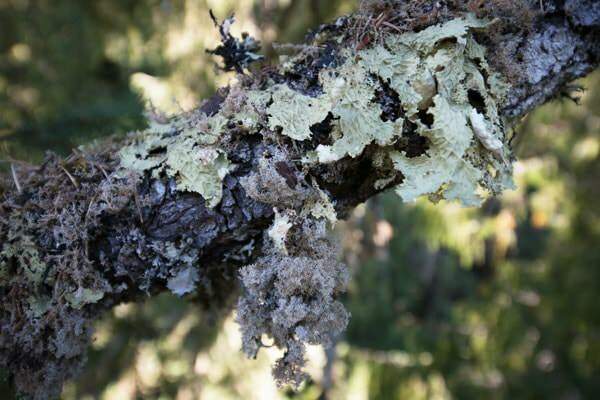 But as I paused there with my hand against the lichen, suspended by ropes slung around the branches of a tree that didn’t personally invite me there, my perspective shifted. This tree was not my friend. That was my own word and an assumption. So I attempted to search for a new idea, one that might transcend human emotions and instead be found in proximity and intention. Respect wasn’t quite it — respect still seemed too human an idea. Understanding that while the tree and I don’t have a shared language, it’s possible we have a shared concept of acknowledgment and recognition. And perhaps, with an effort to stop anthropomorphizing trees and instead phytomorphizing myself, I could better understand how we might co-exist as true good neighbors. This perspective gave a new depth to my relationship with the sentient individuals that comprise the forest. Symbiosis experienced. Reciprocity revealed. It was an Avatar moment for sure. Soon enough, Ben and John emerged from beneath our feet. We hung out in our harnesses, taking in the sweeping view. 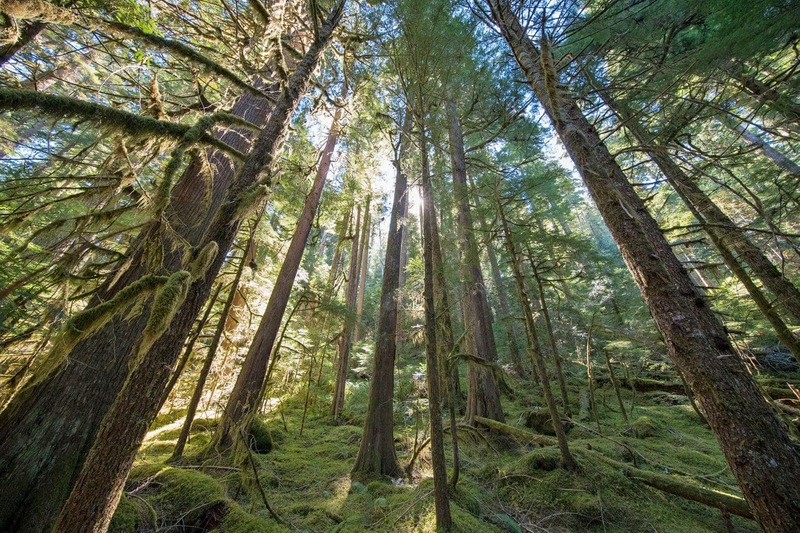 360 degrees of old-growth splendor. 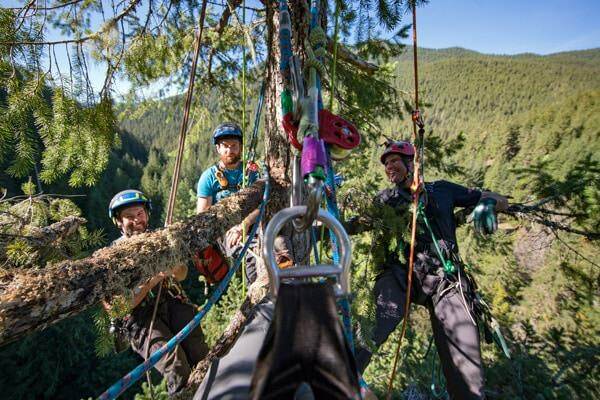 From this vantage point, we chatted on about the Opal Creek Ancient Forest Center and how its conservation efforts protected all that we were witnessing from our 200′ arboreal seats. We shared a heartfelt conversation about wanting to intimately connect others with old growth trees in order to firmly root a profound awareness of our symbiotic relationship with them. Mutual preservation by way of mutual recognition. With the promise of a stream-side dinner of sweet potato and black bean quesadillas, we decided it was time to return to the ground floor, but not without a few more gulps of the canopy breeze and, of course, some photographic evidence of where we had just been (in the unlikely scenario that we would ever forget!). Back on familiar territory, I paused to glance up at where we had just been moments before. I already wanted to go back. Head out of the clouds (but only literally), hugs and high fives shared among us, it was time for the next chapter in our treemendous weekend adventure: Rock-a-bye Kelli in a treetop. We filled our bellies on a scrumptious dinner made on the spot by Damien and dined next to Opal Creek. Surrounded by ancient firs and hemlocks, the shadows grew long and the laughter grew loud. Then it was time to turn in — or up, rather — for the night. Damien climbed up our night tree first, and I followed. And while I felt solid in my earlier ascent, and this one would only be 75′ up instead of 200′, the struggle became real. 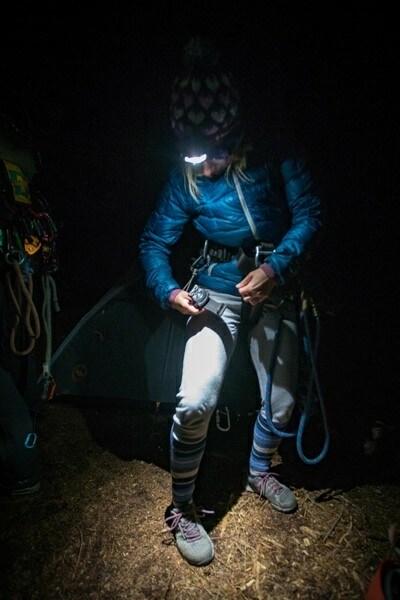 The friction of my raw fingers on the rope proved agonizing, causing me to stop and rest in my harness every few feet to shake out the sting. Damien tucked me in with sage advice on where to hang my helmet and water bottle for the night. He coiled the end of my rope next to me in my Treeboat with a fluid talent not unlike a fly fisher casting a line. It was mesmerizing. Soon John joined me in our avian penthouse, where I waited with smiles, sleepy eyes and chocolate truffles. The truth is, I hardly slept that night. I was sufficiently comfortable, the waning summer still offering friendly warmth. And despite a brief dream in which I tumbled out of the Treeboat only to flip back around to the top, I wasn’t nervous. This felt like a home I could get used to. The cedar fronds within my reach were comforting in their gentle shushing and sway, and both John and I couldn’t resist petting them. To anyone who has ever felt the slightest tug of appreciation for trees, please consider taking the ascent into the canopy (alongside folks who know what they’re doing, such as Expedition Old Growth). 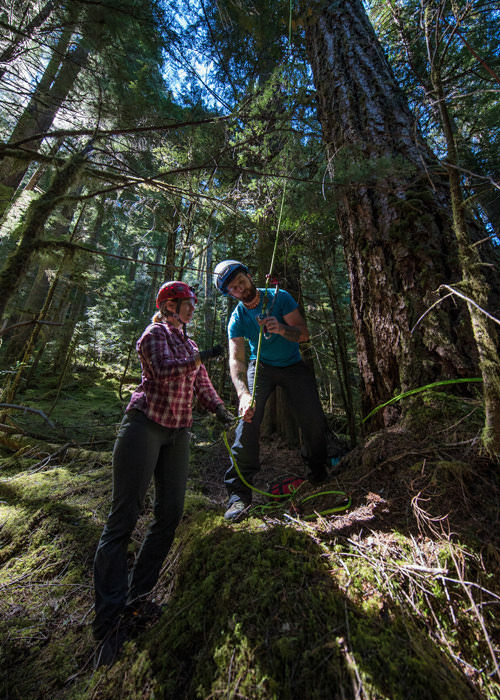 Expedition Old Growth can cater an experience that best suits what you’re after, whether it’s an overnight, a family day trip, an educational class outing or even an “elevator ride” up into the canopy. While I can’t speak for anyone’s experience except my own, I cannot imagine you’ll return to roots-level without a newfound understanding of this breathtaking symbiosis. I’m still dizzy with elation over the experience and am challenged to reinterpret my own relationship with trees, no longer seeing them as a “renewable resource” or even “friends” — but instead as wondrous, mysterious neighbors in whom I can trust and for whom I will strive to be worthy of theirs. 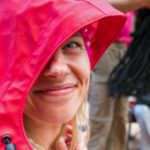 Check out the full photo album from John Waller/Uncage The Soul Productions. 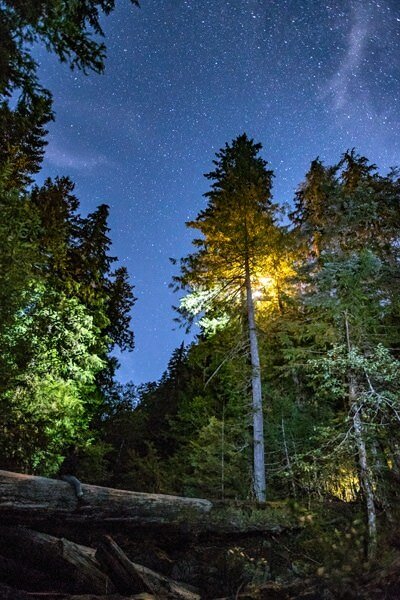 Sign up for workshops, expeditions, wilderness medicine courses and outdoor school at the Opal Creek Ancient Forest Center. You can even rent a cabins and enjoy a few days in the fascinating historic mining outpost of Jawbone Flats.